← Ever Hear of a VEGAN Butcher Shop? Today is the first day of our sixth installment of Juice for the Community! 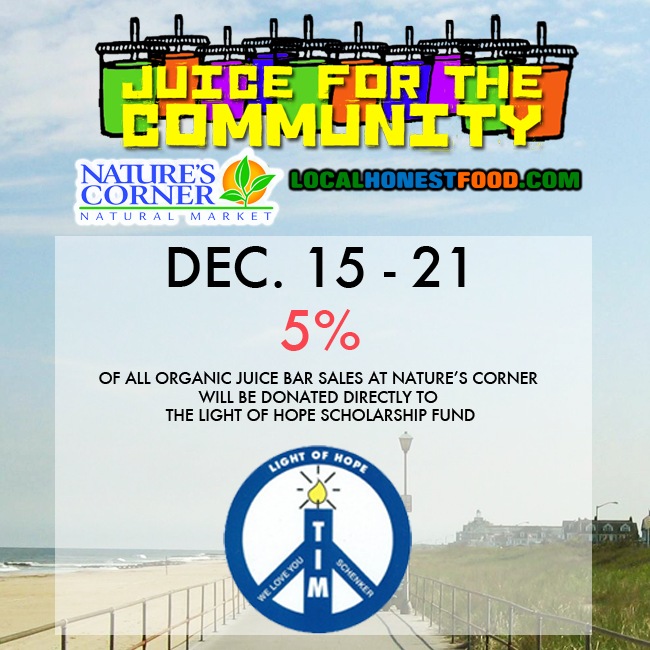 That means 5% of all sales at our Organic Juice Bar today through Sunday will be donated directly to the Tim Schenke Light of Hope Scholarship Fund at Manasquan High School. The Fund presents awards annually to a few peer-nominated seniors from MHS who are a “light of hope” to others. This entry was posted in NCNM Events, Stuff We Dig and tagged Juice for the Community, light of hope. Bookmark the permalink.